Reminders app may not be everyone’s favorite productivity app but it does the job it is intended for pretty neatly. 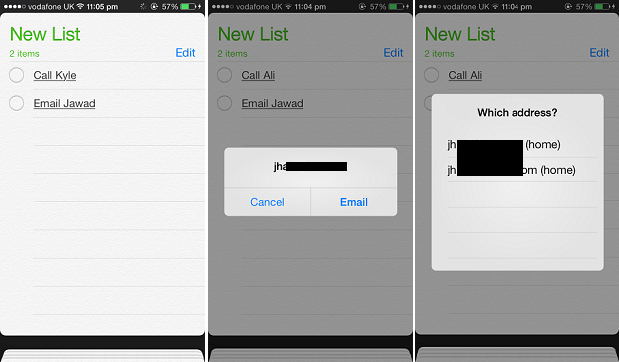 If you are a dedicated user of Apple’s Reminders app for iOS 7 who is interested in making it better then you should try the Reminders Pro tweak from Cydia. This hack adds some really useful feature to the stock application making it more convenient to use. Reminders Pro brings the ability for users to create communication related reminders such as reminders for Facetime, Text or email. These reminders are created as action-based, something that is not possible without Siri by default. The tweak even allows users to type in keywords of their choice for call, text, email and Facetime actions. Once you type in the name of the person you want to set up the reminder for along with the action keyword such as ‘Call Steve’ the tweak will underline the reminder and will display the call pop up whenever you tap on it. It matches the name with your contacts to find the right details for your reminder. It also adds more options for repeat times so users can select the days they want a reminder to be repeated and filter out the days they don’t want to be reminded about any task. Another feature of this tweak enables the Reminders app to auto detect the Phone numbers as well as web addresses entered by the user and perform functions on it such as calling the number in question or opening the links in Safari. You can download the Reminders Pro tweak from Cydia for free.